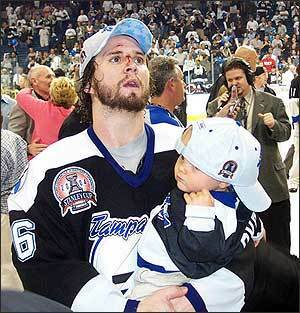 One day after Meszaros was acquired from Ottawa in a deal for defensemen Filip Kuba and Alex Picard along with a 2009 first-round pick, the Lightning reached terms with their newest acquisition that will pay $24 million over six years. The back-loaded contract will pay the 6-foot-2, 218-pound defenseman $2.5 million next season, $3.25 million in 2009-10, $4 million in 2010-11 and 2011-12, $4.75 million in 2012-13 and $5.5 million in 2013-14. There's good news, and then there's bad news. The good news? The Tampa Bay Lightning have gotten below the salary cap. And the bad news? The average age of the defensemen currently listed on their website's roster is 23 years old. The oldest is 26 (Niskala), and the youngest is 20 (Quick). Haven't these guys heard the saying that "defense wins games?" The average age of their forwards is 27 years old - and that's including the two outliers of 40 (Recchi), and 42 (Roberts). Without them, that number drops to a little over 26 years old. That is, of course, including all 27 forwards listed on their roster as of today. That's a 4-year discrepancy between the defense and the forwards, which actually isn't all that unusual. Although, typically, it goes the other way around. The defense us usually around 5 years older than the forwards since it usually takes longer for defensemen to learn their jobs. It makes me wonder if they're going to take the avant-garde approach of fielding 4 forwards and one defenseman during even-strength situtions. Yeah, I don't know about this. I mean, I'm all for doing revolutionary things - since I'm pretty much a revolutionary at heart - but this just doesn't make any sense to me. And it probably doesn't make much sense to many other people, either. This is not 1984, you know. The Lightning are not the Oilers, Lecavalier is not Gretzky, St. Louis is not Kurri, Prospal is not Messier, and Smith is not Fuhr. They will have a very hard time winning in 2008 (and 2009, for that matter) if all they have is scoring and goaltending. And that's assuming no key personnel gets injured along the way. The defense is shaping up to be a very good one - in about 3-5 years. It's takes a while for a defenseman in the NHL to figure out where he needs to be and what he needs to do before he's competent in his job and his position. It's not their fault that they're inexperienced, but that's still going to make everyone's jobs that much more difficult to do. And as for the forwards, what in the world are the Lightning going to do with them all? From what I understand, most of them have one-way contracts. The most likely option is to put some on waivers, so they can be sent down. Can you imagine any of the established players being okay with being sent down to the minors, tho? This isn't baseball, you know. And then to just let them be picked up without getting anything in return? That's just poor business sense right there. Another question for me is, what exactly does Melrose think about this? And does he have any say in it? If his authority is already compromised by the ownership, then that's not going to be a very good situation - not for anybody involved, including the fans. If only the ownership would take a minute and explain their team-building philosophy, then I think that would make everyone feel better about it. For Kuba & Picard?! Huh? Get rid of two defensemen for one? Let me get back to you on this. I need a little time to wrap my brain around this one. Melrose: Vinny would be "the perfect captain"
"Perfect" is rather an extravagant word, don't you think? Of course, I don't believe there's such a thing as perfection. But then, I guess that's another story. So who, exactly, is Melrose kidding here?
" "I'll watch the dressing room. A leader will take over the room," Melrose said. "I'll watch at practice. Are they leaders and the first guys in drills? I'll watch workouts and how they are with the younger guys. I have a captain and three assistants to name, so I have a lot of work to do." "
Is there any doubt about this? We all know that Vinny will be captain of the Tampa Bay Lightning - again - unless he chooses to turn it down. Which he might, you never know. Some guys prefer not to have that hanging over their heads on top of trying to do their jobs night in and night out. I don't think he will turn it down, but then, I'm not exactly privy to Vinny Lecavalier's inner thoughts. In all honesty, Lecavalier wouldn't be my first choice for captain on this team. Nothing against Vinny at all, but I think another guy or two would be a little bit better fit. The first guy that comes to mind is Jeff Halpern, although he's out injured until likely December or possibly January. I like the idea of Marty St. Louis as captain, too. It's a personality thing more than anything else. However, that being said, I do think that Lecavalier would be a very good captain if/when he gets the nod. I don't buy into the "best player on the team" or "face of the franchise" captain-choosing philosophy. So for me, a guy's got to have the actual character and leadership skills to be a captain. And Vinny's a proven leader, he knows the game, his teammates look to him for guidance, and he has their respect. So they could certainly do far worse than choose him. Although, really, I think teammates ought to choose the captain & assistants. The players know best who ought to lead them - even on an overhauled team like Tampa Bay is where half of everyone is new. But maybe that's just me. Let’s talk about propaganda. Actually, let me be more specific than that. Let’s talk about the Canadian hockey media’s NHL propaganda. And, in regards to that, let’s talk the NHL’s Southeast Division. I frequently read Canadian sports websites for hockey news, and I’ve been doing that for years. To hear the Canadian hockey media tell it, the Southeast Division has no purpose, no reason to exist – when they even deign to acknowledge it at all. It’s the redheaded stepchild of the NHL. It’s in their august opinion that the entire division ought to be relocated and scattered across Canada. Put hockey back where it belongs, they say. After all, no one watches hockey in the Sunbelt, and certainly no one goes to games. The NHL ought to just shut down the Southeast Division and put teams where they belong – in places like Halifax, Québec City, Hamilton, Winnipeg, and possibly even in places like Saskatoon or Medicine Hat. Saskatchewan needs an NHL team, right? I hate to burst your hockey propaganda bubble, but your assessment of the Southeast Division isn’t exactly right. Perhaps two out of the five teams are struggling, but that leaves the other three doing alright. And, let’s not forget that two of the last four Stanley Cup champions have come from that division as well. For instance, the Tampa Bay Lightning, whose record was rather dismal last season – dismal enough to win the first pick overall – still sold enough tickets so that the St. Pete Times Forum averaged out at 94.6% capacity (according to ESPN) for the entire season. Think about that for a second. The St. Pete Times Forum was on average 94.6% full all season for a losing team in Florida. The Detroit Red Wings were at 94.2% capacity (ESPN) during the regular season, and they won the Cup. Hockey is alive and well in Tampa, thank you. Now can we all get over this ridiculous idea that Tampa is not a hockey city? And that they can’t draw crowds and don’t have a serious fan following other than the Snowbirds that come down every winter? However, let me point out one simple fact. All of the teams in the Southeast Division – other than Florida, of course – had a higher attendance percentage than either Chicago or Boston last season, both of which are Original Six teams and both of which are considered established diehard hockey cities. You may want to say that those numbers are from Boston and Chicago having poor seasons. Well, Washington was the only team in the Southeast Division to make it into playoffs. Not to mention, again, Tampa Bay coming in dead last out of 30 teams. And Boston made playoffs as well. So that excuse doesn’t exactly hold water. So, seriously, why the bias? The numbers don’t hold up the opinions of the Canadian hockey media. Sure, it seems like moving teams to Canada would be a no-brainer. But then ask yourselves this: why did teams leave Winnipeg and Québec City if that was truly the case? The reality is that there’s no guarantee that an NHL team will succeed in any Canadian city, just because it’s hockey and it’s Canada. Just like there’s no guarantee that hockey will succeed any American city. However, before you start spouting off things like the Southeast Division is failing because hockey doesn’t belong in the Sunbelt, look at the numbers and the facts. The Southeast Division isn’t failing. It’s doing just fine. Over on Yahoo Sports, the Puck Daddy blog wants to know what five things the NHL can do to make the sport better. So I figured, why not? Here are my five things, in no particular order and off the top of my head…. 1. Make the nets bigger. And not by feet, just by a few inches. How about making the nets just four to six inches wider? That’s not so much, is it? No one but the shooters and the goalies would see the difference. But two or three more inches on either side of the goaltender could really help the scorers – and fans. 2. Let the goalies roam free! Get rid of the trapezoid behind the net. If the goalies can puck handle anywhere, they’re more likely to help out their teams. But they’re also more likely to mishandle the puck and help out the other team, too. You just never know what might happen if the goaltender handles the puck. 3. Enforce all of the rules. And be consistent! The worst thing is having the officiating be great in October, then be bad in February, and then even worse during playoffs. The rules are there for a reason, you know? 4. Shorten the season. I live and breathe hockey, but even I get burned out around the All-Star break – as do many other NHL fans that I’ve talked to. I can’t imagine how the players keep it up. Somewhere around 60-65 games a season – and keeping the playoffs exactly the way they are – sounds about right to me. 5. Broadcast on a major network – all season long. ABC, NBC, CBS, whatever. Share the hockey love with everyone, from the beginning to the bitter end. One game a week, make it perhaps regional or divisional across the US, and let everyone have a chance to discover hockey on their own one quiet Sunday night. Would anyone like to add anything?